A Great Value and there is no limit on photography and unlimited pictures compared to the chapels! Please do not call venues, We lease out there location at a discounted fee! This is for minister and photography only. A facility fee varies on the season and location of the Springs Preserve. One of Las Vegas best kept secrets! Have your wedding photographed at the beautiful Springs Preserve Botanical Gardens. Weekends and later times by appointment and availability Only ! Includes fee for leasing the grounds at Springs Preserve. Transportation is included at no charge From Hotel to Ceremony and back to hotel including up to 2 guests. 6 Rose Bouquet and matching Boutonniere. Call for pricing. Go to our Video Page for samples and Additional Pricing. 1. * All Copyrights To All Pictures (You Own The Pictures) 2. **A Full Set Of Hi-Rez Color Pictures and A Full Set of Complimentary Hi-Rez Pictures Converted Into B&W and Sepia, 3***Transportation Provided By KK’s Photography up to 2 guests 4****Edited and enhanced images, all your photos are edited and enhanced in Adobe Lightroom and Photoshop. Pictures Taken At Springs Preserve Gardens! **Add Additional Hours For Your Reception, Party, Dinner, Strip Tour, ECT! **Each additional hour after one of the photography package tours is $150.00 per hour. It is not the same as the venue pricing above. Small Cakes (4 to 6) servings and Champagne! Compared to other chapel packages where you get 6 or 12 pictures and then have to buy your additional pictures up to $1000.00. *Up to 2 Guests and 2 Hours Total Time *(additional guests will have to provide their own transportation) Includes Las Vegas Strip Approximate Time 2 hours (Including Travel Time) from pick up to drop off. Transportation is included at no charge From Hotel to Ceremony including up to 2 guests. 1. * All Copyrights To All Pictures (You Own The Pictures) 2. **A Full Set Of Hi-Rez Color Pictures and A Full Set of Complimentary Hi-Rez Pictures Converted Into B&W and Sepia 3***Transportation Provided By KK’s Photography up to 2 guests 4****Edited and enhanced images, all your photos are edited and enhanced in Adobe Lightroom and Photoshop. Pictures taken at the Las Vegas Strip/Las Vegas Sign. $ 625.00 Approximate Time 2 hours (Including Travel Time) from pick up to drop off. Wedding ceremony and photoshoot At The Desert and then a quick stop to the Las Vegas Sign. Later times by apt and availability Only ! $775.00 Includes Las Vegas Strip Approximate Time 3 hours (Including Travel Time) from pick up to drop off. Includes wedding ceremony and photoshoot at the Desert and Las Vegas Strip Tour. **Add Additional Hours For Your Reception, Party, Dinner, ECT! Downtown Fremont Experience Wedding Package $725.00 Includes Approximate 3 hours (Including Travel Time) from pick up to drop off. 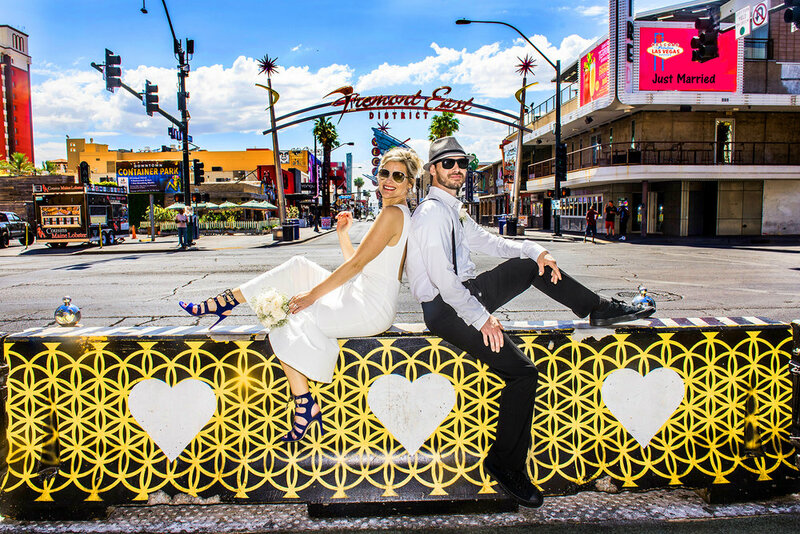 Includes wedding ceremony and photoshoot at Fremont Street Downtown. Transportation is included at no charge From Hotel to Red Rock Canyon and Back to your hotel including up to 2 guests..
Pictures taken at Red Rock Canyon. *Up to 2 Guests and 2 Hours Total Time *(additional guests will have to provide their own transportation) Includes Approximate Time 2 hours (Including Travel Time) from pick up to drop off. *Up to 2 Guests and 3 Hours Total Time **(additional guests will have to provide their own transportation) Includes Approximate Time 3 hours (Including Travel Time) from pick up to drop off. Transportation is included at no charge From Hotel to Ceremony and back to hotel including up to 2 guests.. 1. * All Copyrights To All Pictures (You Own The Pictures) 2. **A Full Set Of Hi-Rez Color Pictures and A Full Set of Hi-Rez Pictures Converted Into B&W, Sepia, & B&W w/Color 3***Transportation Provided By KK’s Photography ***Transportation Provided By KK’s Photography up to 2 guests 4****Edited and enhanced images, all your photos are edited and enhanced in Adobe Lightroom and Photoshop. Pictures taken at the Floyd Lamb Park. Get Married at The Dry Lake Beds with our minister and myself and then off to Nelson for your wedding photography! *Up to 2 Guests and 3 to 3.5 Hours Total Time *(additional guests will have to provide their own transportation) Includes Time 3 to 3.5 hours (Including Travel Time) from pick up to drop off. Add another hour or hours : (See Photo Packages Page) for pricing for your reception. Pictures taken at the Nelson Nevada and The Dry Lake Beds. Pictures taken at the Las Vegas Strip. **Add Additional Hours For Your Reception, Party, Dinner,, ECT! This pricing is my Hourly Pricing Page is different then the wedding package pricing.